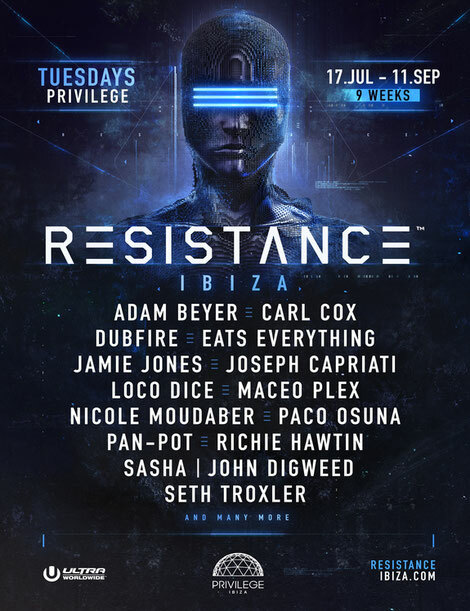 The second annual edition of Resistance Ibiza recently announced the headliners for its nine-week residency at Privilege this summer. Adam Beyer, Carl Cox, Dubfire, Eats Everything, Jamie Jones, Joseph Capriati, Loco Dice, Maceo Plex, Nicole Moudaber, Paco Osuna, Pan-Pot, Richie Hawtin, Sasha | John Digweed and Seth Troxler will headline with the event’s biggest lineup to date. Returning this year every Tuesday for a full nine weeks from 17 July – 11 September, the concept aims to make an even bigger waves this season.